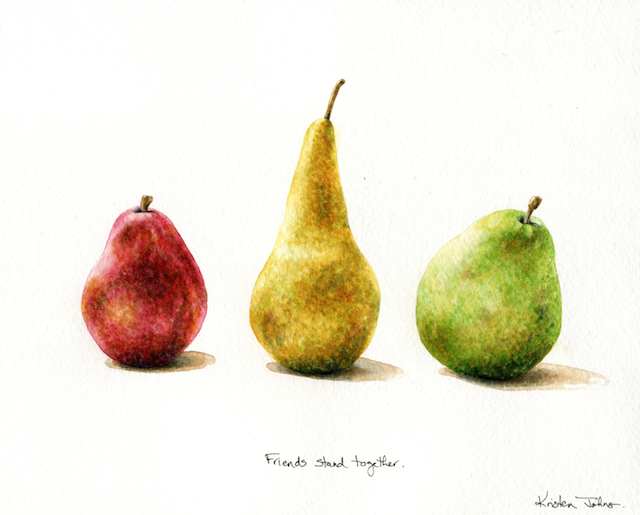 There hasn't been anything very inspiring growing in my garden this week, so I decided to paint a subject that's an old favourite of mine - pears. I found these three varieties at the grocery store and was quite happy to be immersed in their lovely shapes after a busy week last week. And I'm not sure why, but my old style of painting with acrylics has come through into my watercolour painting with this one. I used to paint with acrylics and used a "dabbing" brush stroke a lot. I guess old habits die hard, and it was just a matter of time for my dabbing to appear in my watercolours. I like how it turned out and it felt... good. 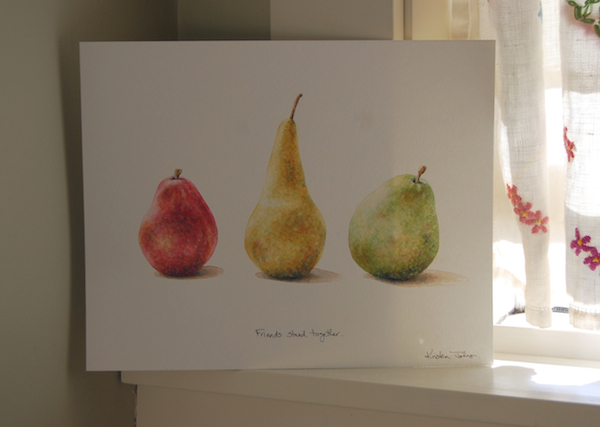 As I was dabbing away, these three pears certainly turned into three ladies standing together, each with their own colour, shape and shadow. It reminded me so much of all the wonderful female friendships I've had over the years and how important they are at every stage of life. I decided to title this one: Friends stand together. prints, bags, phone cases, pillows etc. available in my Society6 shop. Love the gorgeous "girls! Thanks! Thank goodness for best friends!